Just started playing gigs? Here are a few tips that could help you to up your stage game, helping you to win over the audience and build new fans wherever you play. A good setlist will keep your audience engaged throughout. Aim to start and end on your most energetic and fun songs – you want to begin and end on a high note (not literally – you can begin and end on any note you want). If your music is fairly complex or physically demanding, you may want to get most of your challenging songs out the way at the beginning when you’re feeling freshest. Above all, make sure that you have enough material to last the entire set. In fact, you should plan an extra song just in case you get cheered back on for an encore. Practice is essential for minimising embarrassing mistakes such as forgetting lyrics or slipping up on a note. Ideally, you want to be able to perform your songs in your sleep. If you’re part of a band, make sure that you’re practicing together so that you’re all rhythmically tight. Practicing won’t just make you play more fluently, it will also make you more confident as you won’t be afraid of making mistakes and will be able to focus on other things such as your stage presence or engaging with the audience. Make sure to practice in the venue on the day before the gig too – this will get you used to the setting and could allow you to decide where to position yourself on the stage. Good sound quality is as essential as good playing. 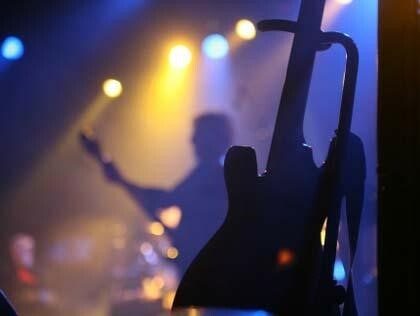 The venue and the sound staff may play a large part in this – it’s best always doing a sound check to ensure that everything is right in the mix. If you’re playing an unconventional venue or don’t trust the sound system there, you may want to invest in some PA speakers. Your musical equipment can also have a big impact on the sound quality. Don’t settle for a cheap practice amp if you’ve got a friend who can lend you theirs. You may even want to invest in better quality instruments if you feel that these are dampening your sound. Stage presence is all about how you command the stage. All in all, you want the audience to feel that you’re having fun – staring awkwardly at your shoes and not moving isn’t going to encourage much crowd interaction. Unless you’re playing a series of slow ballads, you should try to move and engage with the rhythm. This may be something you want to practice in a mirror or in front of friends and family if you feel you’re too stiff. You may even want to watch other bands perform to borrow tricks. If you’re the frontman, you may have to work on talking to the crowd and finding ways to fill the gaps between songs – there should never be silence. If you get nervous and have a tendency to babble nonsense between songs, consider planning out what to say between songs even if it’s just introducing the name of the next track. As you get comfortable on stage with experience, you’ll be able to improvise more and match your stage presence to the audience. Picking an awesome outfit can improve the way the audience react to your music. You want to come across cool and distinctive – unless your schtick is to be deliberately uncool. If you’re playing as part of a band you may want to establish a theme to reinforce a sense of harmony. It’s important that clothing is practical as well as stylish. Loose clothing could get in the way when playing instruments, whilst overly tight clothing might not be ideal if you plan on moving around a lot on stage. You should also consider the temperature – dressing light is usually advisable as you’re likely to work up a sweat during your set if not from activity most certainly from nerves.